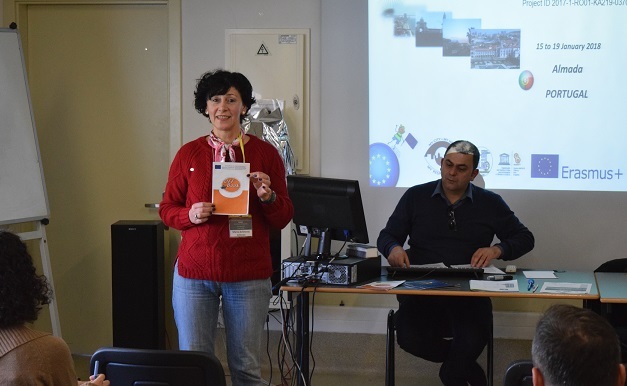 During the Erasmus+ KA2 Project Meeting C1: My City, My Home, My Responsibility (CHIME) that took place in Almada, Portugal between 15-19 January 2018, Maria Achitenei presented the Erasmus+ KA2 project: OFF BOOK, in which Colegiul National de Arta "Octav Bancila" is one of the partners. After having presented the development of the project, M.Achitenei handed OFF BOOK Brochures to the participants. Due to the fact that two art schools were involved in the transnational project meeting, an art school located in Thessaloniki, Greece, declared themselves very interested in OFF BOOK and willing to experiment the methods that will be written by the OFF BOOK partners.